Here's a new soft-touch duo out of Vancouver. The pair, Flash Palace, do a job of quilting together strains of dream-state guitar music and trance-beated sample-psychedelia and sure it does fit pretty easily into our current sensitive tradition, mapped out to this point on August 5, the year two-thousand and ten, but that doesn't stop these handful of tracks from being excellent, and from effortlessly plucking elements of both rockist escapism and righteous programmed beats into the same approachable tracks. 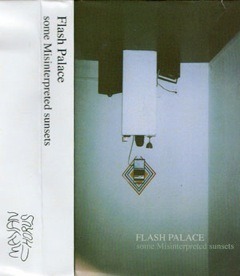 Their some Misinterpreted sunsets cassette is out on Mayan Chorus.